Carole Hinders is a 67 year old grandmother and owner of Mrs. Lady’s Mexican Food, a restaurant located in Arnolds Park, Iowa. She has operated the restaurant for almost 4 decades. Unlike many restaurants, Ms. Hinders doesn’t except credit cards. Each day she takes her cash receipts and deposits them at the local bank. Ms. Hinders owes no taxes to the IRS, is in full compliance with filing returns. Nothing to worry about, right? Wrong! Two IRS criminal division special agents knocked on her door and told her she was being investigated for money laundering. That already sounds scary but the IRS took things one step farther. They seized her bank account. $32,820.56 gone. No hearing. No due process. Is that legal? Unfortunately, yes. The IRS can seize money if they believe a person is engaged in money laundering. In a civil forfeiture case, the government takes the money first and you must fight to get it back. Although never charged with a crime, the IRS filed a civil money laundering forfeiture action in federal court. Weeks later, Ms. Hinders was interviewed. 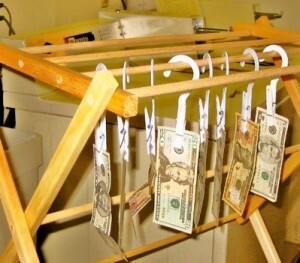 It soon became clear that she wasn’t engaged in money laundering. The case was dropped but not without significant harm to Hinder’s reputation and business. Hinders was required to hire a lawyer, had checks that could not clear, a bank that no longer wanted her business even though she did nothing wrong and could use the money in her account to buy food for the restaurant. Since 1970, the federal government has required banks to report anyone who deposits or withdraws more than $10,000 in cash. Called a currency transaction report, these reports are sent to FinCEN, the Financial Crimes Enforcement Network. IRS agents routinely sort through these reports looking to ferret out criminal activity. Smart crooks and drug dealers know that banks report large cash transactions so many will make multiple smaller deposits. If a bank detects this activity it can file a suspicious activity report or SAR. The bank doesn’t give customers notices of these reports. Drug dealers and others who intentionally break up cash transactions to avoid detection can be charged with “structuring,” a form of money laundering. What about Carole Hinders? Evidently the IRS thought she was structuring cash transactions to avoid reporting and decided to seize her cash without notice. Simply visiting her business or speaking with her bankers, however, should have tipped them off that she runs a cash business and had been depositing cash for 38 years! The civil forfeiture laws allow federal agents to move swiftly against terrorists, drug dealers and criminals but if not used properly, it can also cripple legitimate cash businesses. Things have become so bad that some banks now shy away from cash businesses simply because of the attention it receives from law enforcement. In the aftermath of the Hinders and other similar cases, the IRS has pledged to be more careful in future money laundering cases. That isn’t good enough for Carole Hinders, however. Several Congress people have also jumped into the fray. As for Ms. Hinders case? Media reports say that the IRS has not apologized and believes they were justified in their action. Perhaps if Hinders gets her day in court we may finally learn what really happened. In the meantime, people with cash businesses need to be very careful in how they operate. If you find yourself the target of a criminal money laundering investigation or are subject to a civil forfeiture, seek help from an experienced criminal tax attorney immediately. or by telephone at (414) 704-6731 (direct). All inquiries are protected by the attorney – client privilege and kept in confidence. We represent IRS whistleblowers worldwide. We also invite you to visit our IRS whistleblower page.